Several groups staged a rally Saturday on August 19th against white supremacy and in solidarity with Antifascist demonstrators who were injured and killed one week ago in a series of neo-nazi attacks in Charlottesville Virginia. After the rally a small group of demonstrators were targeted by police after they left resulting in the police macing and arresting two minors for filming them, one adult being given a traffic citation and one other adult being arrested. 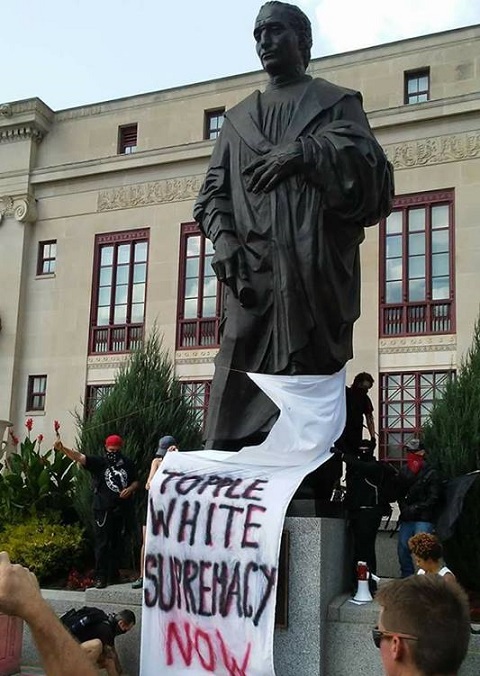 Several demonstrators called for the removal of the statue of Christopher Columbus from the front of city hall. Christopher Columbus ordered the killing of 99% of the native population in what is now the Haiti and the Dominican Republic for failing to provide him with sufficient gold which can not be mined on that island. Failure to provide gold on and individual basis was used a cause for chopping the hands off of men women and children resulting in starvation and death by disease. This provided the impetus for the genesis of the Atlantic slave trade as there were no longer enough locally born slaves to make the plantation economy profitable. A small group out of the almost 300 demonstrators carried weapons because of threats from the neo-nazi movement to attack Charlottesville solidarity demonstrations around the country on August 19th in conjunction with their aborted Free Speech rally that was to be held in Boston. One car load of these were targeted while leaving. The quartet was placed back in the car for over an hour with the windows rolled up in the heat still dripping from mace while charges were manufactured. Both minors were charged with resisting arrest because one had attempted to film the police. A traffic ticket for a one week expired tag was issued. After searching every possible database and checking the serial number of every weapon and accessories no charges relating to any weapons were filed. The police told the driver his children were being taken to a Christian halfway house and would not be arraigned or able to be released until Monday. Upon his arrival to retrieved the children the driver was told his children were not there. The location of the minors was determined to be the juvenile detention center and after many calls from friends, family and lawyers the two minors were released. The family and the other adult arrestee declined to give direct statements to the Mockingbird on the advice of an attorney retained that evening. We will be following the case and any resultant civil rights lawsuits. Columbus Police declined to comment and abruptly hung up when the case was mentioned.